By now many of you have heard of the passing of the great Christopher Lee. Very, very few actors have cut across so many of my interests quite like the way Sir Lee did. If you have spent any time here whatsoever you know of my love of the Hammer Horror and of Lee's portrayal of Count Dracula. But he also starred in other films that I equally enjoyed. Not so well known is my love of the James Bond films. But it's true, I love watching the Bond movies and some of my best birthday memories was going to see many of the Roger Moore bond movies in the theaters. One of m favorite Bond villains was Francisco Scaramanga, played by Lee and written to be something like a Moriarty character to Bond. Speaking of Moriarty and Holmes, Lee has played Sherlock, Mycroft and even Sir Henry Baskerville in three different Sherlock Holmes productions. Playing Baskerville against Peter Cushing's Holmes was a treat. Christopher Lee is most well known for his take on Dracula and maybe more so that any other actor he defined the role. His verbal and physical sparring with best friend Peter Cushing as various members of the Van Helsing family made these movies extremely popular. Lee and Cushing would star in several movies together even outside of the Dracula ones. One of my favorites is still "The Creeping Death". Christopher Lee would go one to be featured in over 200 movies. "The Wikerman", not the god-awful Nicholas Cage movie, gut the original creepy pagan one featuring Lee as Lord Summerisle. "To the Devil A Daughter" which has Lee battling Richard Widmark over the soul of Nastassja Kinski. Yes in case you are wondering, Lee's character wants her for the Devil. Lee also gave a great (to me) performance as Dr. Gannon in Disney's "Return to Witch Mountain". I remember him freaking me out in this. It was Lee's performances as Saruman in Peter Jackson's "Lord of the Rings" and the "Hobbit" movies that made him well know to a younger generation. Lee gave Jackson's film an air of authenticity. Christopher Lee knew Tolkien, he had read Lord of the Rings many times. He was very, very particular about how you pronounce everything. He once said "if a man spends time creating and entire language then you must be careful to say everything correctly." or something to that effect. He also played Count Dokku in the Star Wars Pre-olgy films. While the role was done as a means to honor his legacy as Dracula, I could not but help to see the ghost of Peter Cushing there. Tarkin and Dokku had no screen time together, but I think it is fitting that Cushing and Lee could share this film series together. Casting him as a dentist in the newer Willy Wonka movie is exactly the type of twisted joke I come to expect from Tim Burton and Lee did not disappoint. 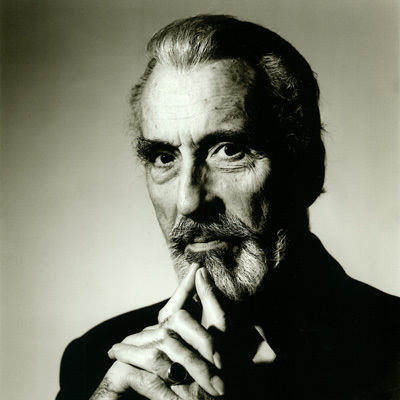 Christopher Lee once said of his friend Peter Cushing that "he died because he was too good for this world". I say Lee died because there was nothing left for him to do. This meme makes it's way around the net right around his birthday, I think it is appropriate here as well. I want to end with this. I have a new project coming up. Nothing I want to talk about right now, but this will be the dedication in the book. This book is dedicated to memory of Christopher Lee (1922 - 2015). His contributions to my horror and fantasy education could begin and end with Dracula and that would be enough. But few people have cut across so much of my own fandom. He was Lord Summerilse, Sherlock and Mycroft Holmes, Francisco Scaramanga, Saruman, Count Dokku, Death, Dr. Victor Gannon, Father Michael Rayner and yes, he was Dracula. So much of this book would not be possible if it were not for him. He was much more as a man than any of these characters. But that is how I knew him the best. "And then he greeted Death as an old friend, and went with him gladly, and, equals, they departed this life." For your consideration, here is my Christopher Lee inspired stats for Dracula for Mutants & Masterrminds.